There were many Hensley families in West Virginia in the 1800's. I have transcribed all the Hensley, Hensly (and other spellings) listed on the Federal Census Records for West Virginia for the years 1820, 1830, 1840, 1850, 1860, 1870 and 1880. 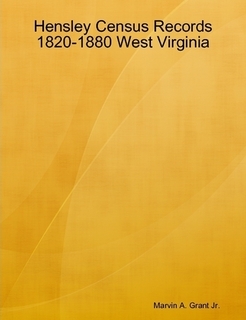 West Virginia was still part of Virginia before 1863, but I include those counties in Virginia that later became part of West Virginia. The early census records only list the name of the head of household, but the 1850 census was the first to list every member of the household by name (except slaves.) Note: For the 1850 and 1860 census I have also included the Slave Schedules but not the Agriculture schedule or the Mortality Schedules. Includes a full name index. Edition: First (29 Jan 2009). You may order from the publisher and pay via Credit Card, Debit Card or PayPal. They do not accept cash, check or money orders. Click below to order online or to preview the book. If you wish to pay by check or money order you must order it from me via snail-mail. Send $20.00 to me at: Marty Grant, 3291 Alton Phillips Road, Kinston, NC 28504. The price for snail-mail orders includes shipping and handling. Once your check has cleared I will order the book for you and have it shipped to your address.